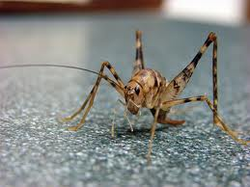 Camel Crickets - are found all over the world and are common in basements, crawl spaces, storage sheds, garages, or any dampprotected area or building. The average length of a camel cricket is ½ of an inch to more than 1 ¼ inches ilength. They are light tan to dark brown with a humped back appearance. Camel crickets are more active at night, but when disturbed they will jump frequently. They are more of a nuisance pest but can cause some minor damage.